I’m Adam Yera, creator of CompleteAgent. If you want to start a career in real estate selling houses but don’t know where to start, this page is a great place for you to start. My belief in helping you learn is simple: Share the truth, be honest, work hard, and lead by example. That’s what I’m all about, and that’s what CompleteAgent is all about. What is a Complete Agent? Before anything, why not join the CompleteAgent community on Facebook, a group of friendly real estate professionals who are all there to help each other succeed! Building a successful real estate business that takes advantage of systems of automation and technology that allow you to generate, nurture and convert leads without spending hours per day on the phone cold calling. In other words, we work smarter, not harder. Instead, we CompleteAgents invest our time upfront creating systems, processes and valuable content. We leverage technology to live a complete life. A CRM or Contact Relationship Manager is the first essential tool for any salesperson that likes the feeling of closing deals. CRM stands for Customer Relationship Management, so by definition, a CRM is an app that helps you manage your relationships with current and prospective customers. Even the old-fashioned Rolodex was a CRM of sorts. But these days, that’s not enough. A true CRM should do a lot more than that, thanks to the R in its name: relationship. Most CRMs are designed to help you string together the relationships in your contacts: the messages from the same person, the team of people involved in a transaction and the people in your sphere. They’ll help you see the big picture, and they know exactly what to talk about the next time you email someone—or what your team members have already asked them. There are a ton of options and even a couple of free ones like Insightly and Agile CRM for example. Those may be good options for some, but I don’t recommend that path because, well you get what you pay for. If you think you can get by using a spreadsheet, notebook or just by keeping things "in your head", I really don't recommend that either for three important reasons. CRM's are built around creating, building and nurturing real relationships and conversations. CRM's make it easy for you to track all of your leads and numbers, good CRM's help you engage your prospects and clients in an authentic way. Lead follow up and nurturing automation. Agents who don't use CRM's usually do a crummy job of following up because it's depended upon them to do the actual follow up. Be consistent. Over 90% of online leads are converted after the 7th touch point. CRM's take all of the guesswork out of consistently following up with your leads. After trying and testing just about every relevant CRM on the market, I usually recommend Contactually for most agents. Click here to check out our full 2,000+ word breakdown of the top 3 CRMs for real estate agents in 2018. It's built around creating, building and nurturing real relationships and conversations. Where a lot of CRM's make it all about the numbers, Contactually stands out by helping you helping you engage your prospects and clients in an authentic way. Contact buckets help you focus on the people you want to follow up with and then reminds you when it's time to. I particularly love the buckets aspect of Contactually that controls how often I'm reminded to touch base with that contact. 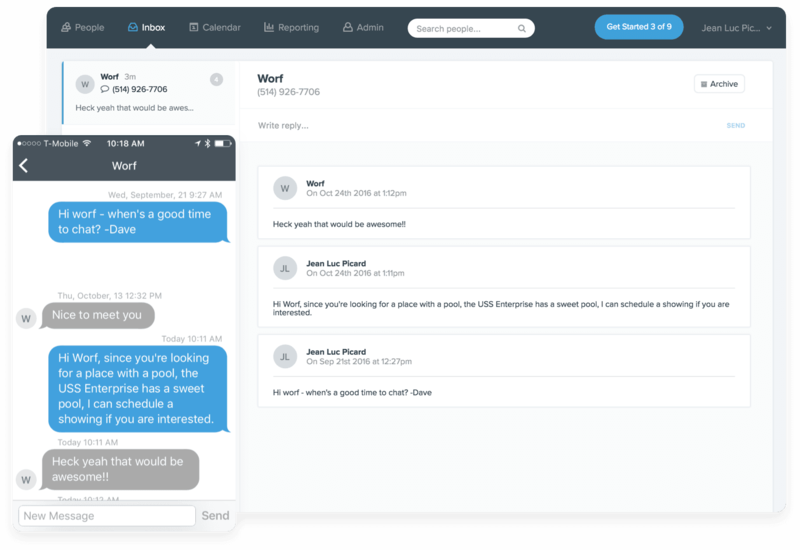 ScaleMail, Email Templates, Programs and Pipelines are the perfect tools for crafting authentic and personalized interactions. These are some of my favorite features and Contactually is one of the only CRM's that I believe got it right when designing. Before you get going full steam with your real estate sales business, I’d love to share with you some insights and guidance that I’ve learned about selling real estate the smart way. I want to hear your stories. I want to know how else I can help you. I want the CompleteAgent experience to be our experience, together. That’s how we all learn and grow together, including me. I do my best to respond to emails. I treat everyone equally. And I firmly believe that I’m not special, just a normal guy who enjoys working hard and working smart. In everything I do here with CompleteAgent, I truly want to help Realtors grow their business and their lives. Learn the latest and greatest lead generation strategies. Learn how to better qualify and convert leads into clients. Setup your systems for success and deliver amazing service, every single time.